According to ASB bank in New Zealand dairy markets have reassessed the Kiwi production outlook. It says in the weeks following Fonterra’s large cut to its production forecast and the official drought declaration, markets feared the worst. Subsequently over February, markets bid up prices aggressively in anticipation of New Zealand milk being scarce on the ground. Turns out, markets needn’t have been so worried, it says. ASB says rain has come to many parts of New Zealand, easing the fears around the worst impacts of the drought. It says considering production was up 10% last season, flat production growth would be a solid result in 2015. On this basis, it sees this weeks result as a further correction to the market’s earlier overreaction. The latest GDT auction, showing a 10.8% decline, is a worry but should not be viewed in isolation and must be analysed closely for the reasons behind the drop, according to Pat McCormack, Deputy President and Chairperson of ICMSA Dairy Committee. 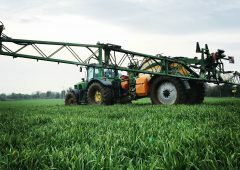 McCormack cited as one primary cause the fact that an expected drop in supply owing to a drought in New Zealand has not materialised and therefore extra product has been supplied to the last two GDT auctions. 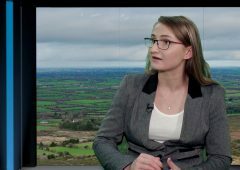 “But the average price index is still 9% above its lowest point in November and the almost parity of the Dollar and the Euro exchange rate means that Irish farmers are still in a strong position”, said McCormack before going on to observe that the market movement might usefully serve as a counter-balance to some of what he called “media-giddiness” circulating around the end of quotas. 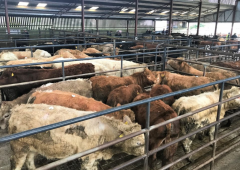 McCormack said the next 18 months could see a lot of uncertainty in the market as suppliers and international buyers come to grips with the potential extra supply that could come to the market. 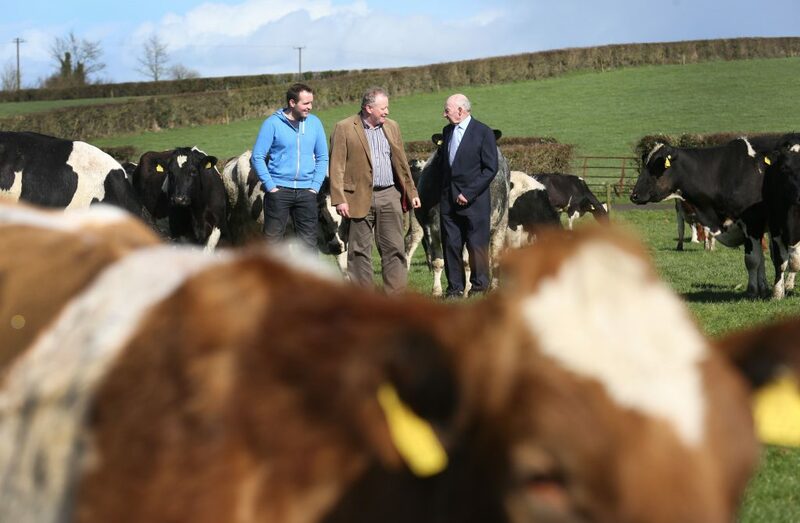 “The expectation of new jobs for the rural economy is another likely plus but everything depends on the farmer milking his or her cows and the proceeds and benefits of the expanded dairy sector have got to reflect or they just won’t happen – it’s actually that simple”, he added. IFA National Dairy Committee Chairman Sean O’Leary has said the 10.8% fall in the average GDT auction price was obviously influenced by speculations of strong production increases in Europe post quota, which may well not materialise as European milk prices are below break-even in most member states. He said the auction, at 23,000t, saw 42% less product traded than the same auction in 2014, confirming the trend of thin trade experienced outside the auction. “The disappointing GDT results are symptomatic of the new volatility and the current uncertainty, and are the second negative results after six strongly positive auctions. 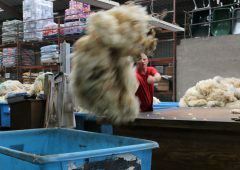 Coming as they do on the day the post-quota era begins, this price decrease is unfortunate, but I would be slow to over-interpret it,” he said. “I think buyers are trying to hedge their bets and influence rising prices in the face of relative uncertainty. 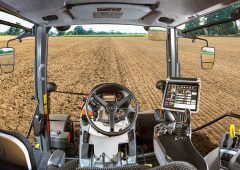 I believe they may yet be proven wrong in their expectation of big production increases in Europe where margins are tight and feeding cows to increase output may not make economic sense in the short term at least,” he said. “I would urge our co-ops to hold their nerve, and to hold milk prices through peak while greater clarity develops as to European dairy dynamics post-quota,” he concluded. The latest Fonterra Global Dairy Trade (GDT) auction results will put pressure on all Irish milk processors to reduce the farmgate prices they pay in April, according to Strathroy Dairies’ Director Ruairi Cunningham. It suited a number of the co-ops to pay what can only be considered to be an inflated price during January, February and March, he said. 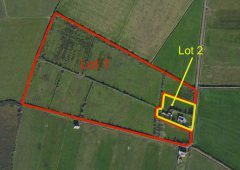 “No doubt, part of the strategy being played out here was the need to get as many farmers as possible signed up to new supply contracts. 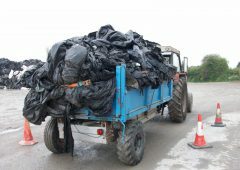 “But these prices were totally out of kilter with what the international markets were delivering for commodity dairy products. And this gap is widening, given the result of the latest Fonterra auction. 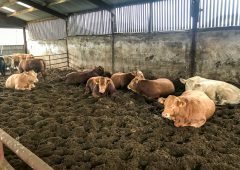 “The reality is that the volumes produced on farm during April will be well up on what has been produced to date this year. And this trend will be maintained throughout the spring and early summer months. 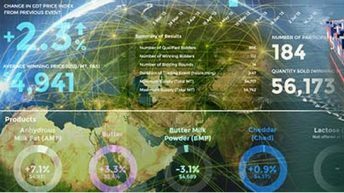 The latest GDT event saw prices paid fall by an average of 10.8% with whole milk powder returns down 13.3%. These results follow-on from the 8.8% fall in prices recorded at the previous event. 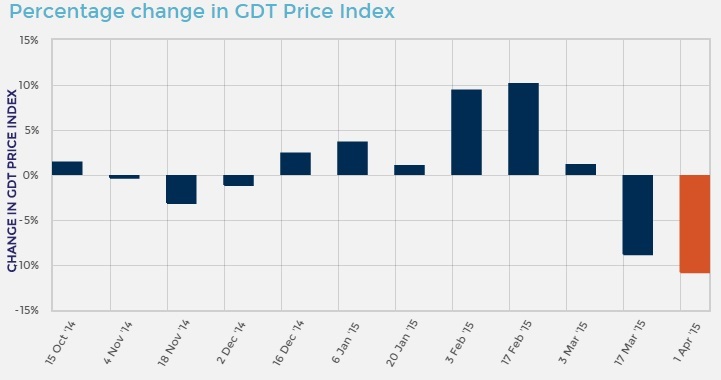 “It is significant that the start of the downward trend in GDT prices coincided with the decision by Fonterra to increase the quantities of product submitted for auction,” said Cunningham.